The Eliot Grand offers rich finish options, bold design, and ample storage with adjustable shelves that make a statement and add function. Fireplace has an Antique Gray finish and includes a mantel, firebox with screen kit, remote control, programmable thermostat, timer function, brightness settings and ultra bright Vivid Flame LED technology. 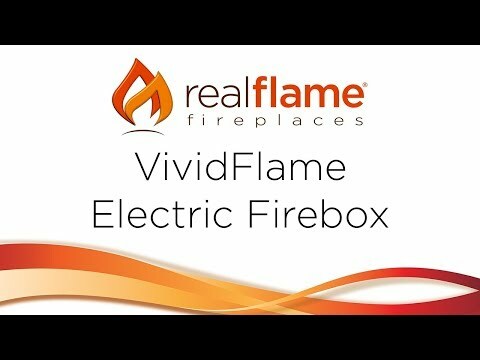 The Vivid Flame Electric Firebox plugs into any standard outlet for a convenient set up. The Vivid Flame Electric Firebox has a 1500 watt heater that is rated for over 5100 BTUs per hour. Some assembly is required. Provides supplemental heating for up to 1000 square feet. 1,000 Sq. Ft. 400 Sq. Ft. 300 Sq. Ft. 1,000 Sq. Ft.